Not sure whether you should invest in brand photography for your business? 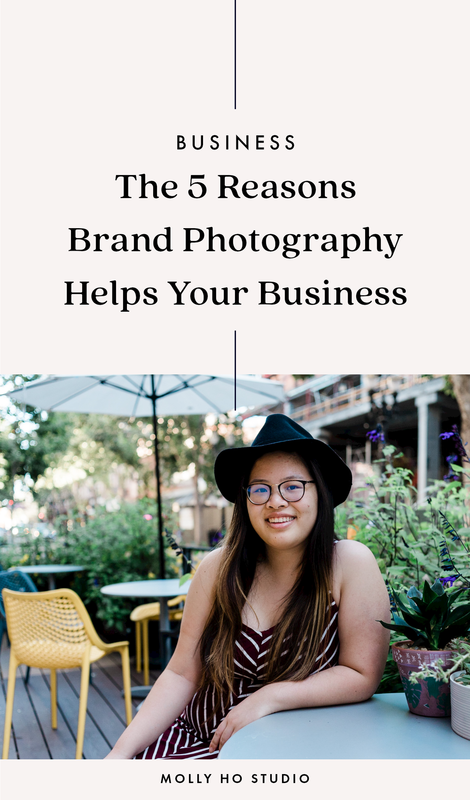 In today’s post, I’m going to share with you the 5 reasons brand photography is invaluable to you and your business growth. Trust me, not only will it change the way you see yourself and your business but you’ll gain so much confidence along the way. And guess what? That’s going help you grow your business too. It shows that you’re committed and that you take your business seriously. Be honest: Do you take someone more seriously when they have branded photos of themselves on their website, landing page, Instagram, etc.? Because I do. It shows me that they’ve invested in their business. And if someone is asking me to buy their services or products, I want to see that they’ve invested in their business first. Now I’m not saying you absolutely need brand photography to grow (because it’s definitely not a requirement in order to be successful), but it helps when you’re selling higher priced services or products. There are multiple ways you can invest in your business and brand photography is just one of them, but trust me: it’s going to really elevate your brand positioning and presence. It’s an opportunity to share more about you, your business, your personality, what makes you unique, etc. as well as build a deeper, more meaningful relationship with your community. I’m a huge believer that your personality and who you are is translated through photos -- and that branded photography can be a powerful tool to connect with your community. Are you playful and bold? Thoughtful and soft-spoken? Inviting and warm? Do you spend a lot of time with people? At home? At coffee shops? At the beach? What are some of your brand values? Courage, empowerment, hope, honesty, resourcefulness? These are all things and parts of you and your business that you can communicate through branded photography. You want your dream clients and customers to be able to “know, like, and trust” you. If you were to post a photo of yourself on Instagram (and hopefully you do that already), would someone who’s scrolling through their feed be able to recognize you? Would they know who you are and what you do? Now, you don’t need branded photography to do this. And we’ll talk more about this in point 5, but one of the benefits of working with a photographer is that you’ll get multiple images that you can use to build that trust and relationship. Because remember, if people don’t see you, they don’t know about you. You want people to remember who you are - your personality, your style, your vibe, etc. Okay, let’s be honest. This matters. We’re attracted to what looks good, because it makes us feel good. I’m just going to put this out there. You can agree or disagree with me, but there’s a reason why corporations spend so much money on brand photography every year, because it matters. It matters to their customers, just like it might matter to your own customers and clients. Working with a photographer who knows what they’re doing and how to make you and your brand look good. Just because you can DIY something yourself doesn’t mean you always should. By hiring and working with a brand photographer, you’ll have their insights and expertise on how to get the best photos of you. So most people I know aren’t comfortable in front of the camera at first (I know I wasn’t when I started having my photos taken), so make sure to find a photographer you’re comfortable and confident with. And if you do feel nervous about being in front of the camera, tell them and ask what they do to make their clients feel more at ease. While it’s great to have your friend take a photo of you, unless they know what they’re doing, there’s probably going to be a lot of directing, self-posing, and editing on your part. At the end of the day, make sure to do whatever feels comfortable and true to you. I just wanted to share my own experience and a few reasons how brand photography will really impact and help your business grow. Because remember, branding is all about how people see you and your business so you want to make a good impression. Now, I want to hear from you. Share in the comments below. Have you invested in brand photography for your business before? If so, what was your experience like? If not, why not?